Last week was my sweet neighborfriend’s birthday. The past two Tuesdays we’ve had the opportunity to paint together in celebration. It was something I never would have taken on by myself but when she agreed to go together, I was all for it. Though for the record, this was a style of painting I’d never done before. I’ve gone to classes where we painted an owl or a tree on the beach or something more concrete and I’ve sat with Mess Cat on the back porch and painted things we’ve seen on Pinterest or ideas we’ve come up with ourselves, but I’ve never done an impressionistic painting. Our teacher reminded us that the idea behind this was to be loose and free in our painting and covering the canvas. I have OCD say what now? Yeah, it was hard at first. But when I started letting go of what I perceived as imperfections, I really began to enjoy what I was doing and worked to make it my own. I was doing fine until I made the silhouette of the man on the sidewalk look like he had no neck. When I went back and touched him up, I could breathe again. He looked more like a human and less like the Hulk, thank goodness. Last week we did all of the base colors, and outlining, but yesterday was all about adding the color and the detail. We moved quickly and with purpose. As we were finishing up, I stepped out of the room to rinse my brush. 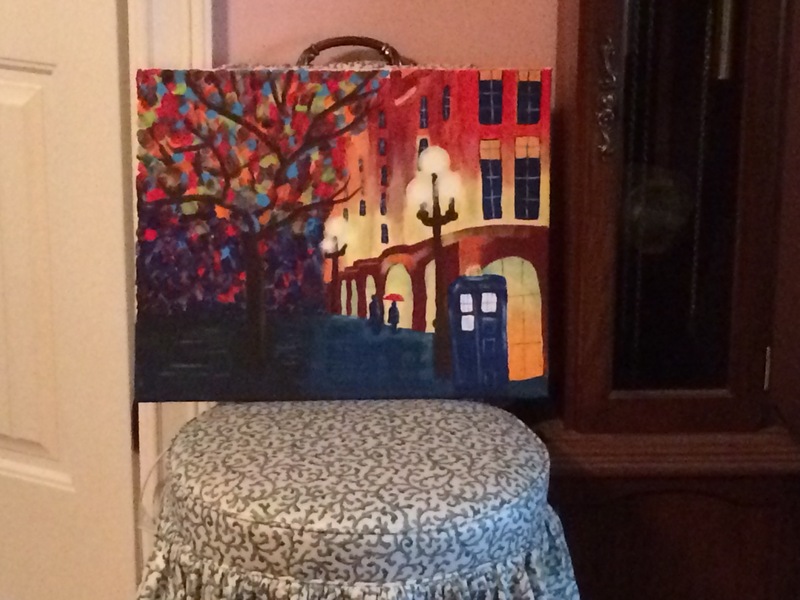 I walked back in and saw my friend’s painting from the doorway. “Girl, that is fabulous!” And it really was. As we gathered our things and paintings and said our goodbyes, I saw this sign that I don’t remember being there before over near the front door to the gallery. Amen. 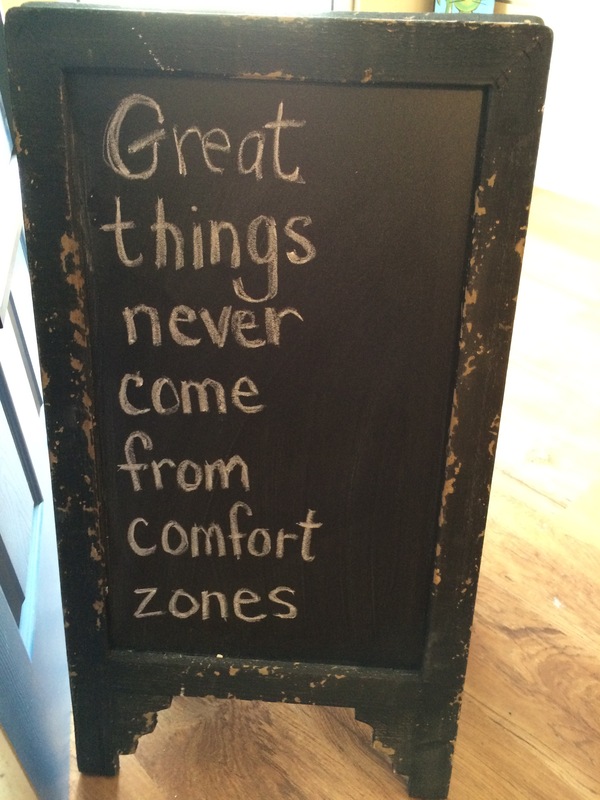 Some of the best things in my life came about when I took a trip outside my comfort zone. Some of the most beautiful and broken and hard and precious and moments I hold most dear in my heart came from crossing that line into the unknown. Tonight I’m thankful for my friend who stepped way out of her comfort zone to paint for the first time something other than a room or piece of furniture. That’s the thing about comfort zones–they are much easier to leave when you have a friend at your side. And way more fun. Also, I’m thankful for the reminder that up close we can all be a mess, and that what we see from afar–from the outside looking in–that can be very deceiving. this canvas I painted, this picture I created–it is an “up close mess, far away lovely thing” all together in one. Broken and beautiful. Messy and magnificent. Wacky and wonderful. Just like all of us, I’d daresay. We are all of the beautiful and broken things, and maybe it’s time we start hanging that on the wall and letting folks up close enough to see all of who we are. The realness of our being. It means being vulnerable, it means being raw and open, but if we really ever want people to see who we really are and all of our magnificent colors–not just the shadows or an impression–maybe it’s time to hang ourselves up for folks to see and appreciate and love. Up close and everything. May we all begin to love the Monet that we are. One point at a time. My painting from across he room. I can handle y’all seeing this. It’s not perfect, but I rather like it. 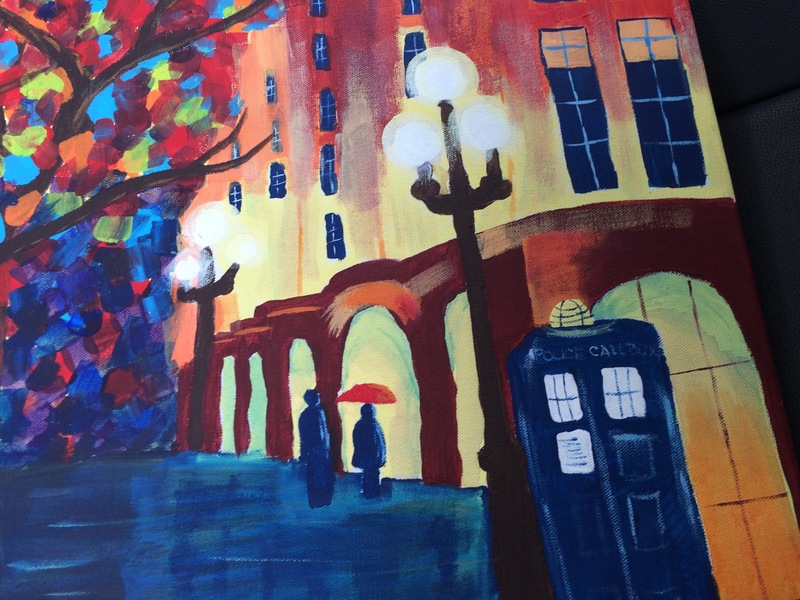 “Tardis in the Rain” our teacher called it. But this. This, I didn’t want to show y’all. It’s rough around the edges and way less than perfect, and there are things I’d love to touch up. But this is me–being vulnerable–and this is the REAL me. Leaning, off-kilter, but here. Go love yourselves, y’all. All of you. It just might be the bane of my existence. Yes, I know I thought that was socks, but socks at least give me somewhat of a reprieve in the summer. And when it’s not being played, it’s being talked about, or books are being read that pertain to it, or we’re asking to watch videos about what others have built with it. It’s as pervasive as kudzu in the south. Maybe more so. And that’s saying something. For those of you who don’t know what it is…..can I come live with you? Okay, just kidding, but no really. 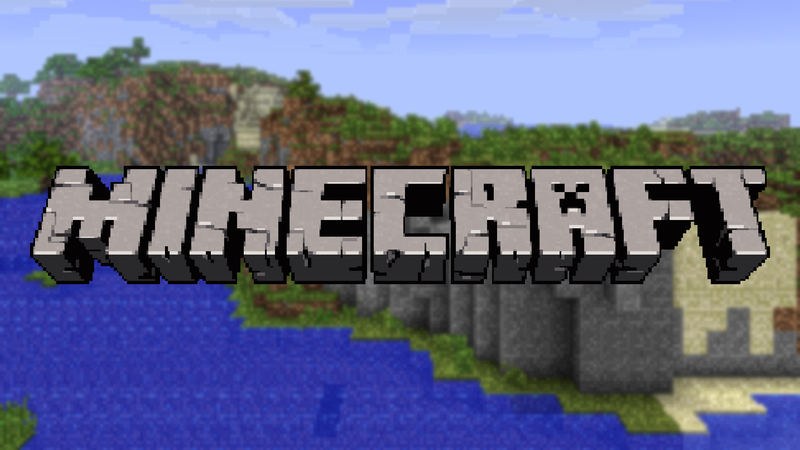 Minecraft is a game you can play on any number of electronic devices where you build things. You can build whole worlds of places and things and whatnot. You can play creative or survival mode, but I’m warning you, have the tissues ready if your little person plays survival. Cooter may or may not have cried on more than one occasion when he lost his life in survival mode and had to start. ALL. OVER. AGAIN. Fun stuff, y’all, I’m telling you. They really enjoy playing it though, and for the most part, it offers them opportunities to be creative and to learn about working together. Both of which I’m completely good with. Recently though they were with some children who were acquaintances. They’d had problems with interactions with them before (you know, just getting to know each other), but this time they all had devices and they were all playing Minecraft, and they joined worlds, yippee, awesome, until it so was NOT. Yep. Houses got destroyed. Worlds were collapsing. Because apparently some folks think that’s fun to do, and they don’t have the same “joining” rules that we do. When Cooter and our Princess came to me later on, complaining about all that had been lost, I pretty much shrugged and gave them the ol’ “nothing I can do about it” stare. Actually it might have been more the “I don’t want to hear it” stare, but they are so similar, it’s hard to tell. The thing is, and what I asked them was, Why would you let someone in your world who has already shown themselves to be hurtful and destructive? And yes, I did point out to them that this was more of a universal lesson not solely belonging to the arena of Minecraft. So we talked about that too. I love my children. I love it when they share with me. They tell me about their silly, wild, wacky, scary, funny dreams. They share about a book they are reading. They talk about what they want to be when they grow up. Or how long they think it will take them to build a robot. How old they have to be before they can watch “Jurassic Park” or how many more days until the new Star Wars movie comes out. I love every bit of it. But #truestory, when they start talking about Minecraft, I zone out. I realize that doesn’t exactly make me Mother of the Year, but it’s all about surviving a lot of days around here, so I get creative and multi-task and let my mind wander when they talk about that game. But just as in the game, we shouldn’t be letting folks who are not kind or respectful or compassionate into our world. They can be destructive and when they take their device home and go back to their own world, we’re the ones left with a mess. A world to rebuild and the sadness of all that is gone. Stand up for your world, y’all. Don’t let those kind of folks “join” your world. Wishing you a day of building up and all the diamond pickaxes* and iron ore your heart desires. *just kidding, I don’t know if that’s really a thing. Because, you know, I don’t really listen. Shortly after I knew the Fella might be the One, I had a dream. It was a time of war, very WWII era like–planes flying over, dropping bombs, warships on the water, fire everywhere, people frantically running. And in my dream, I stood there watching it all. And I had a sense of peace. Because in the midst of all the chaos, I saw the Fella standing over across the way, handling things. And that’s all I needed to know. It’s not that he was rescuing me. Or anyone else. I’ve reached an age where I realize that there is no such thing as someone else really rescuing me. If I find myself locked in a tower, I’d better get to work figuring things out for myself as to how to get out of there if I want out. And if I don’t, that’s on me too. But here’s what I do know. If I find myself locked in a tower or pursued by wicked and evil, I know that I want the Fella there. Yeah, well, sometimes it is to the point of frustrating me just how unshakeable he can be, but when I get myself “situated” as my Mama used to say, I know his calmness is just what I need. He is a rock. My rock. He has seen me through the heartbreak of death and the joy of new life and the fear of illness and worry over raising children. He doesn’t slay dragons for me, but he sure stands by my side ready and willing when I take them on. And he’s okay with me taking them on. Which is pretty huge I think. He empowers me, and he believes I am capable. And he makes me laugh. Which is pretty much my most favorite thing ever. Tomorrow is his birthday. We’ve been together for fourteen of his birthdays now. His first one, we weren’t yet engaged, and his birthday came before mine, so there was ALL THE PRESSURE of what to do about a gift, how much to say in a card, and all the stress. I like being an old married couple so much better. goofy Star Wars humor t-shirt and some Lego minifigures that we hoped he’d like and homemade cards because we are all about the creativity and using all the colors. But he gets that most days anyways. I am thankful for this Fella who was born ALL THOSE YEARS AGO. (Yes for six weeks he’s TWO years older than I am, and I do not let him forget it a single day.) He jokes about how he lived in Georgia for a couple of years when we were both teenagers and how he drove by our exit on the interstate several times and what if, all those years ago…..
Then he laughs and says I would have never given him the time of day back then. I don’t know for sure if that’s true or not. But I’m mindful of a quote my friend shared at Evening Prayer last night. And so, instead of being sad over all the years we missed being together, I am thankful for the fact that conditions lent themselves to this Fella crossing my path a little over thirteen years ago and him inviting me to come along with him. It’s been quite the ride we’ve had, the two of us. I’m glad my Fella’s the One riding shotgun as we see where this road takes us and our crew. Happy birthday, Fella. Thanks for all the days. And the love. But mostly for the laughter. 😉 And because it’s your special day, I’ll save you the last bag of sweet potato chips. Yeah, you’re just that loved. Because of food allergies, we have been around the world and back looking for “substitutes” for those foods we have to avoid. 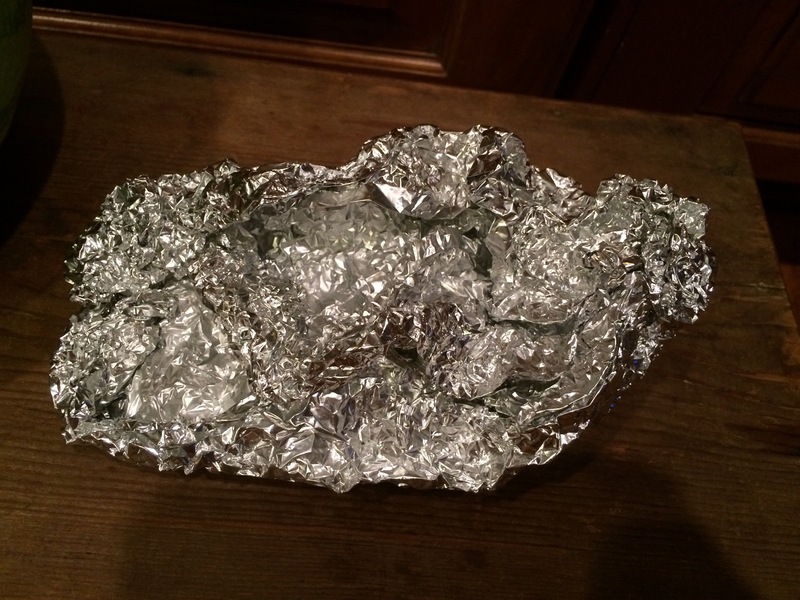 Substitutes that are safe and that we enjoy eating are like finding treasure, because the same old meals day in and day out get very old, very fast. Last June my Aunt found a wonderful substitute that has been huge in expanding our horizons on the eating front. 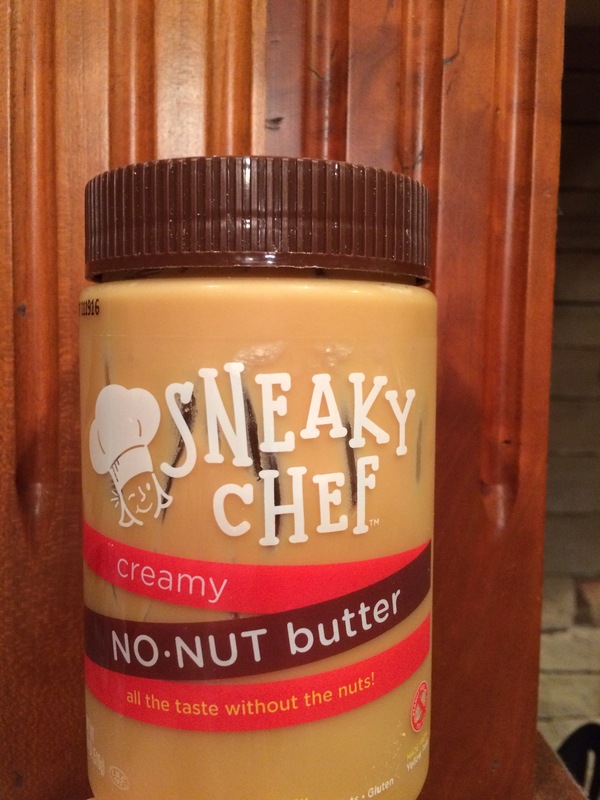 The Sneaky Chef’s No Nut Butter. We love it. In many different ways. Tonight I was thinking about the Sneaky Chef and how she started out encouraging families to enhance their intake of good nutritious foods by “sneaking” certain veggie purees into different dishes. I remember my failed attempt to add cauliflower to homemade macaroni and cheese. I thought it was delicious myself, but I didn’t puree the cauliflower quite enough, and my oldest figured it out. To this day, she hesitates to eat my homemade mac and cheese, worried what I might have put in it. Some days it’s whatever it takes, y’all. As I was thinking about this, it occurred to me that the One who created all that is within our sight and so much more seems to use this “slipping something in unexpected” technique too. How many times have I been in a hard and broken situation and found some nugget of joy or beauty? It has happened more often than you’d think. Goodness tucked in the midst of something that you’d never have suspected. A kindness in a time of darkness. Joy in the midst of pain. But then I like cauliflower in my mac and cheese. May we all find a nugget of good in the midst of the broken or mundane or somewhere else we least expect to find it. This afternoon I needed a nap. It was not going to happen, but I did take a moment and stretched out on the little couch in the living room. That was my mistake. Because instead of closing my eyes and really napping, I looked up at the ceiling. 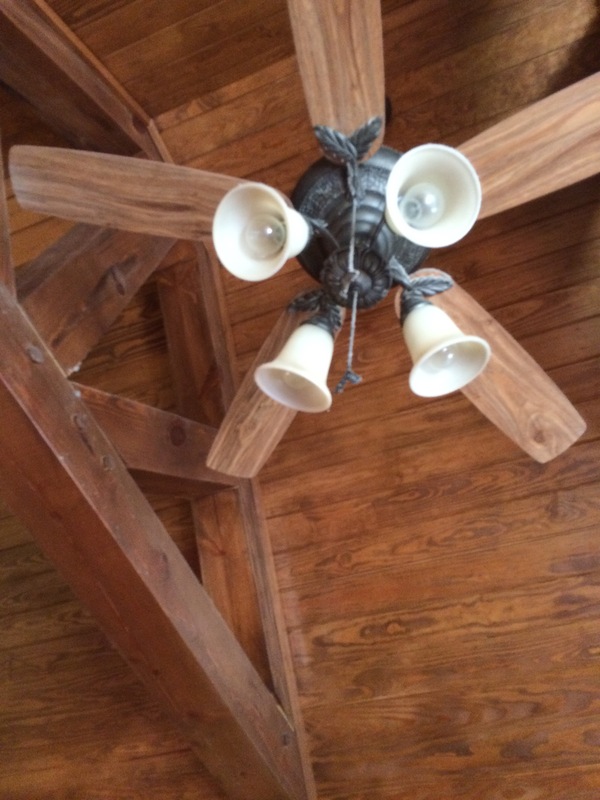 And the ceiling fan. How in the world did the blades get THAT bad without me realizing it before now? Details are not my forte, y’all. Apparently. It troubled me so much that I could not rest. I got up in search of the thingy-how-ya-doin’ that we use to clean the blades. It’s nice because it can stretch out whereas I cannot. Our Princess found it and excitedly brought it in. She went and called Cooter to come in and watch the fun. I used the brush and wiped off the dust from the bottom of the blades, and, shuddering to think how bad the tops were, I stretched out and wiped those too. 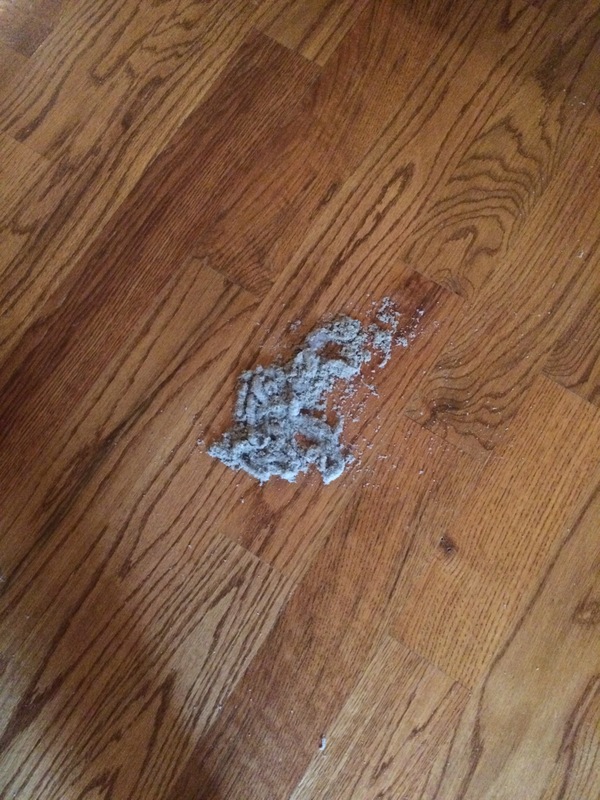 At least that’s what the littles called it as all the dust fell to the floor. I explained, through teeth gritted in determination to reach each and every spot, how dust is floating in the air and the blades catch it and it stays there and builds up to what we can see. As I swept up the mess I made by cleaning the fan, it occurred to me that we are lot like those blades. We go through our day to dailies, collecting bits and pieces of what is going on around us. Somehow all of the energy and attitudes and things we see, read, and hear in a day collect on our spirits. And eventually, if we aren’t careful, it changes who we are, and we need a good soul-searching spirit cleansing to get ourselves back in balance. Back to a good place. Sometimes, like with my floor, things can get even messier before we get to that place. Don’t wander through the dust if you can help it, y’all. Surround yourselves with good energy, people with good attitudes, and read all the good things. 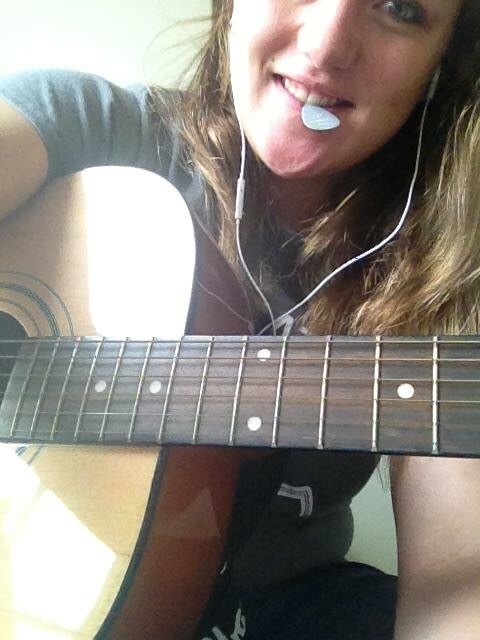 Listen to music that feeds your soul, and look upon the beautiful. Seek beauty in everything, and you will find it. Don’t let the naysayers and negativity in this world latch on to you and bring you down or darken your heart. Take time to soothe the hurts and give lots of hugs. I tend to think hugs help knock the dust off myself. The blades after I’d wiped most of the dust off. No way I was taking a picture of BEFORE. May we all find someone to help us dust ourselves off and begin again and to point out the beauty when we forget. If you need some pointers as you begin to seek beauty, follow my friend Hugh Hollowell’s weekly blog on just that. Beauty. And the relentless pursuit of it. Click here to check it out yourself. (And here to sign up for it.) It’s a good place to dust off.